The story of Troussay begins with the laying of its first stone around 1450. A 1545 act mentions the name of the first owner: Robert de Bugy, later called “the Lord of Troussay”. By 1578, he is an alderman of the city of Blois. His family is ennobled after his death in 1758 and his descendants, holders of the titles: “controllers of the salt attics of Blois”, “collectors of taxes”, “councillors” and “squires of the King”, will widen and embellish the domain of Troussay. In 1732, Troussay is sold to a family of notables from Blois, the Pelluys, a related family to Colbert. In 1741, their daughter, Gabrielle Pelluys the beautiful, married Knight Christophe de Réméon, Claude de Réméon’s descendant, Claude de Réméon who once was a companion of Henri IV, King of France. Gabrielle’s dowry was to be the lands of Troussay to her had. Christophe de Réméon, their fourth child, married Marie de La Saussaye in 1787. Having no children of their own, they adopted Marie’s nephew: Louis de La Saussaye (1801-1878) who inherited Troussay in 1828. Historian of the Loire Castles and a Sologne region specialist, Louis de La Saussaye is appointed chief education officer of the academies of Lyon and Poitiers and, from 1845 till his death, member of “L’Institut de France”. As his friend, Prosper Mérimée (First Inspector of the historic monuments in 1834), he is precursor in the matter of patrimony preservation. In 50 years, he undertook a complete restoration of the domain. He saved numerous decoration elements stemming from the Val de Loire’s prestigious monuments left in ruin and set them back to Troussay. 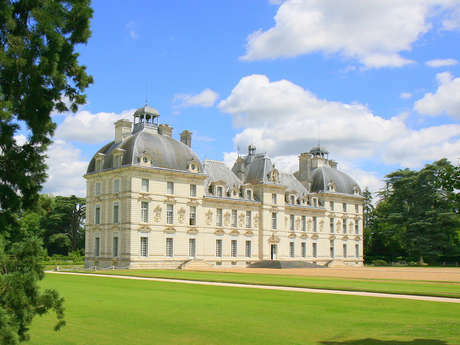 He realized this tastefully done rescue work with his friend Jules de La Morandière, architect of the Loire Castles and who was Félix Duban’s pupil. In homage to their collaboration, a quaint figure on the turret of the North façade unwinds a Latin banner: “Brought together by friendship, Louis de La Saussaye conceived and Jules de La Morandière realized”. 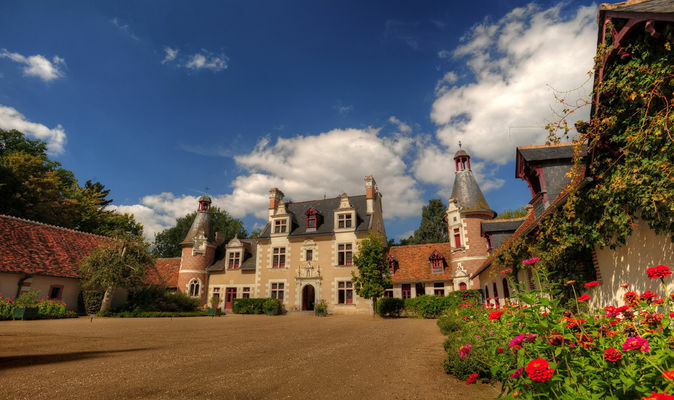 In 1900, the castle of Troussay was sold for the second time by the heirs of Louis de La Saussaye, in favour of Earl Delamarre de Monchaux, learned naturalist, whose wife, Isore Hurault de Vibraye, was willing to stay nearby her family, who live in the castle of Cheverny. Today the owner, Isaure de Sainte Marie, who succeeded to her father, is living at the castle. By avoiding the conception’s mistakes, frequent in his time, Louis de La Saussaye carried out a real small artistic “madness” and gave the former manor house the look of a castle. By the architectural refinement and the elaboration of its towers, its oratory, its invaluable materials and the quality of the elements of former decorations he settled there, Louis de La Saussaye transformed the “Solognot” Renaissance manor house of Troussay in artistic “madness” and in a real castle. Today, on the various sightseeing roads and by its visitors, Troussay is recognized as the smallest of the Loire Castles. Sculptures on stones, ornamentation of facades, fireplaces, doors and wooden windows finely sculptured, painted ceilings – among which one is attributed to Jean Mosnier -, polychromatic stained glasses, fireplace plates and ancient keys, Louis XII stone floor and art furniture of over five centuries can be admired in Troussay. The variety of elements integrated into the architecture, the wealth of the furniture, the complexity is rarely gathered in a human-sized space. Since his arrival, Louis de La Saussaye concentrated his effort on the grounds as well as the kitchen garden that received its particular attention on a conception point of view. 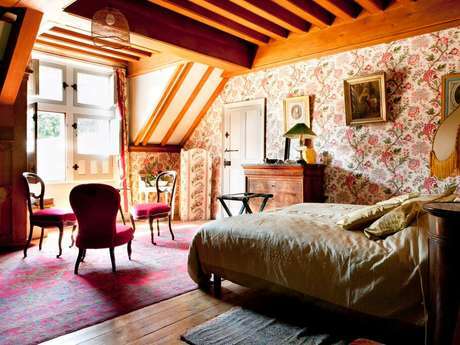 There is no review about Château De Troussay, be the first to leave one !